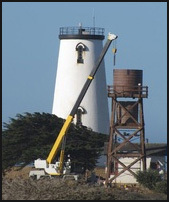 Telecom Archives - Peabody Engineering & Supply, Inc.
Several years ago Peabody Engineering delivered two amazing Water Tower Cell Site Concealments to the Piedras Blancas Light Station in San Simeon, California. The PBLSA requested that Peabody create a replica of the original wooden water tower that once stood at the light station which was originally constructed in 1908. 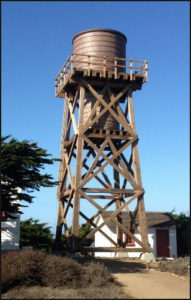 The contractor hired to build the water tower used recycled redwood to construct the two-tiered tower structure. On the first platform they placed the smaller of the two fiberglass water tanks – 9’ tall x 9’ in diameter with an open top – and then continued constructing the tower. When the upper platform was finished, they placed the larger fiberglass water tank on top – 12’ tall x 12’6” in diameter with a fiberglass cover designed to look like an old metal tank lid. Since the tower construction and tank installation has been completed, we have visited the PBLS and even WE are in awe of how realistic these two replica tanks turned out! We are proud of the design and fabrication of these two tanks and so is our customer. Next time you’re looking for great weekend getaway, take a trip up the coast and visit this historical location. Peabody Engineering was honored to receive FCC Commissioner Mignon Clyburn at our product display at the recent Wireless Infrastructure Association Convention in Orlando Florida’s Rosen Creek Hotel and Convention Center. 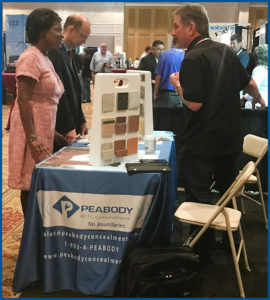 Commissioner Clyburn selected 5 companies to visit in her quest to better understand the wireless telecommunications market and Peabody Engineering’s Cell Site Disguise Guys® approach to creative solutions in hiding unsightly cellular communications sites was definitely one of her priorities. The Commissioner visited with Peabody’s CEO Mark Peabody and asked many questions in order to better understand the landscape in siting concerns across this great nation. Mr. Peabody drew on his 20+ years of experience in creatively concealing cell sites to help Commissioner Clyburn understand the issues that carriers face in getting their sites approved as they struggle to meet the ever growing demand for broadband and cellular connectivity. Mr. Peabody pointed out that cities, municipalities and citizens are concerned with the massive visual pollution created by the countless antenna arrays on buildings and other structures that adversely affect the beauty of their communities and ultimately their quality of life in having their communities blighted by these unsightly antennas, including less than ideal solutions, like artificial trees that are rarely undetectable. only hiding the antennas but actually enhancing the beauty of the buildings the sites are installed upon. She was concerned with the ultimate cost, but Mr. Peabody pointed out that the importance of preserving the beauty of our communities outweighed the marginal cost of concealment in the bigger picture of the multi-billion dollar investment made in infrastructure. “The public has a right to preserve beautiful communities by virtue of the cell phone bills they pay each month for their services and it is the carrier’s responsibility to insure not only good service for their customers, but also good stewardship of our environment, including what we have to look at each and every day.” Peabody said. FCC Commissioner Mignon Clyburn was concerned about how the concealment structures would affect the quality of the telecom signal, but Peabody assured her that because of the unique RF properties of Peabody Engineering’s materials of construction, the signal loss is well below allowable levels. The Cell Site Disguise Guys® were honored to host FCC Commissioner Mignon Clyburn and hope that our brief time together gave her a better understanding of not only our products, but the importance of responsible planning in expanding our wireless infrastructure, keeping in mind the concerns of American citizens respecting unsightly visual pollution of large antenna arrays that are not properly installed to preserve the visual beauty of our many great communities across America. CellSiteSales@4Peabody.com or call (951) 734-7711. The Cell Site Disguise Guys® would like to introduce you to our New Team Member Jonathan Ettere. 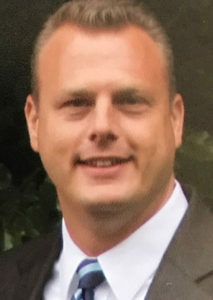 With his decade of Sales and Marketing and Project Management experience, Jonathan joins the team ready to be our Manufacturer’s Rep in The Mid-Atlantic/New England States. He has worked with many companies such as VZW, Sprint, TMOB, ATT, Crown, American TWR, planning and designing telecom projects to completion. His most recent venture of manufacturing of stock and custom made Radio-Frequency (RF) transparent solutions for both the United States and Canadian telecom industry deems him a leader who will bring to the table the ability to coordinate, facilitate and lead a project from start to finish. To read more about Jonathan click below to read our full newsletter. Who doesn’t love a tool that makes their job easier?! We, The Cell Site Disguise Guys®, would like to share with you one such tool that we are very excited to be using a lot more of this year. Introducing “The Dunn Edwards InstaColor® App”. You can use the app on your phone, which can be downloaded either through the itunes APP store or Android Google Play store and there is also a desktop version. 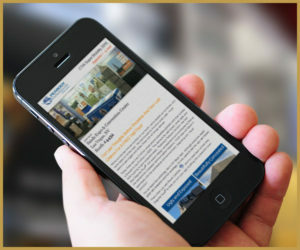 Click the link to read all about it in our first Telecom newsletter of this year. Also in the newsletter, meet our newest team member, he is the one that told us about the tool! 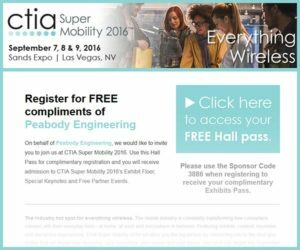 ave you read our latest newsletter on our last thoughts before showtime at the CTIA Super Mobility 2016? We’ve got a few things to say and we want to show you what “ugly and exposed” looks like and what “beautifully concealed” looks like and trust us you’ll want to go with “beautifully concealed” every time. Snooze and you won’t get a Free Hall Pass – don’t say we didn’t try to tell you! Click the button below to register for your Free CTIA Hall Pass but hurry because you must complete this by August 29, 2016. Booth 4452 is where we will be. 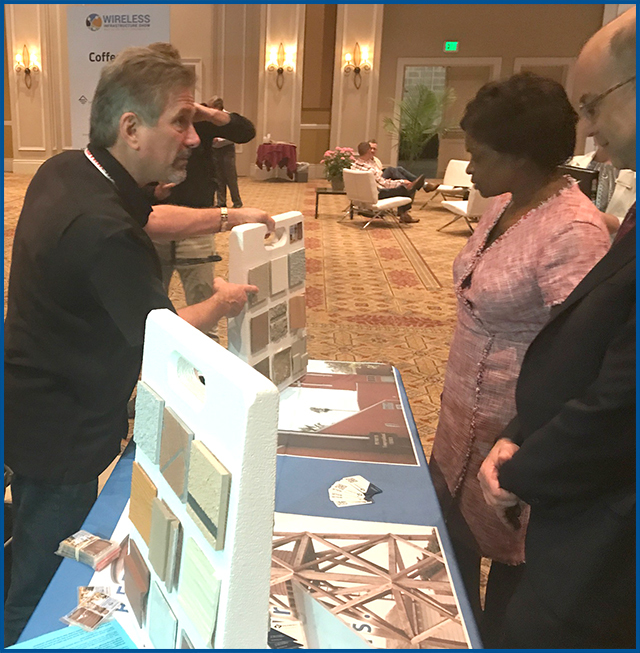 Stop by and let’s get acquainted, tell us about your upcoming project and let’s see how we can work together. We’ve Got You Covered – Concealment Style That Is! o much going on at the CTIA Super Mobility Expo don’t forget to put us on you list of “gotta stop by and see” booth #4452. We want to share with you why we are the industry’s leader in RF friendly telecom concealment. 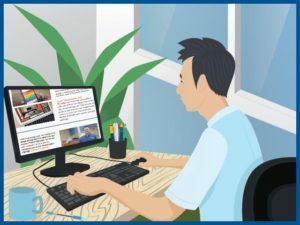 Read our newsletter, see some of our favorite projects and fill out a super quick form if you want to connect with us at the Expo. 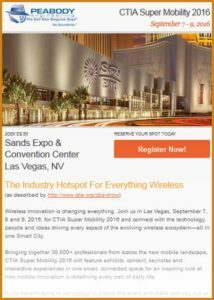 CTIA Expo 2016 Have You Registered? 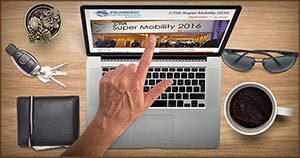 Have you registered yet for the CTIA Super Mobility 2016? 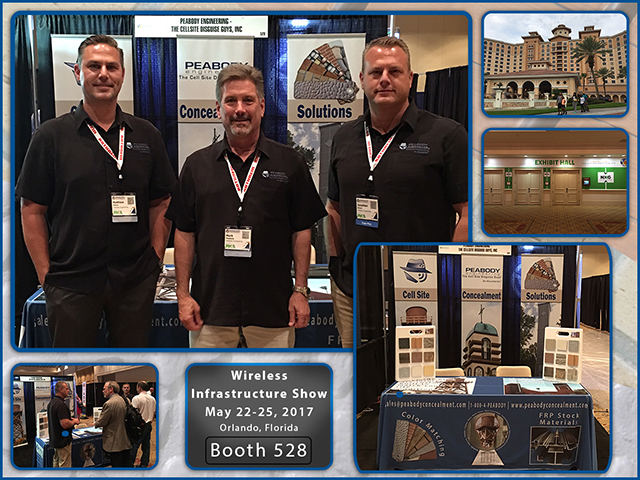 Click image below to read our newsletter about “The Industry Hotspot for Everything Wireless” and how to register. This year it is going to be in Las Vegas, NV Sept 7 -9, 2016. Are you in the market to conceal your cell site? Then you must put us on your “Must See” list, our booth is #4452. Peabody Engineering supports today’s major Tier 1 and Tier 2 telecommunications wireless carriers and companies with innovative cell tower concealment solutions. Recently, Mark Peabody, CEO of Peabody Engineering, sat down with Telecom Reseller to discuss the powerful advantages of RFTC (RF transparent concealment) and the future of cell site design across the globe. From cupolas to steeples, retail spaces and stand alone chimneys, there are so many great ways to extend cell tower reach with a limited investment in large scale stand-alone tower equipment. In many cases, by using existing building infrastructure, cell tower concealment brings strong wireless connectivity to otherwise rural areas. Listen to the entire podcast titled, “Cell Site Disguise By Design” here.